A PART OF the Jackson Park rapid transit line was ordered closed Thursday by Chicago Transit Authority Chairman Michael A. Cardilli because of a suspected structural defect in the Dorchester Bridge. Cardilli said he ordered the temporary closing of the bridge that crosses the Illinois Central Gulf Railroad tracks at Dorchester Avenue "until we are convinced there is no danger." The closure will force about 12,000 riders of the Jackson Park line to use the ICG for part of their trips, or to take other alternatives. The closure caused some confusion during the Thursday evening rush hour as riders had to get off the "L" at 61st Street to take shuttle buses or the ICG. AS CARDILLI had promised when he announced the closing, scores of CTA personnel and Chicago policemen were on hand with bullhorns to tell riders what to do to get to their destinations. But several riders complained that they had not been told of the change until they had reached Garfield Boulevard (55th Street). However, one passenger, who identified herself as Gertrude Lewis of the South Side, said she had boarded the train at the Howard Street station at the north end of the line and had been told of the problem as soon as she got on. "It made us a little late, but it wasn't very bad," she said. "This is the way I have to come to work every day, so I guess I'm going to be a little late every now and then." Others were less philosophical. "I feet real shaky about riding on the trains," said Janice Smith of 6618 S. Stony Island Ave. "I keep thinking, will it fall? I think it's terrible. The rates keep going up and the efficiency of the trains keeps going down. What's wrong with the system?" 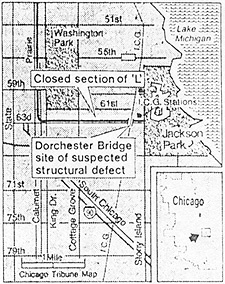 SUSPECTED DEFICIENCIES in the old bridge-built as part of the Jackson Park branch line to take fairgoers to the 1893 Columbian Exposition-were discovered during a semiannual inspection two weeks ago, Cardilli said. "For safety reasons, we are ceasing train operations on this segment (from 61st Street and Calumet Avenue to 63d Street and Stony Island Avenue) pending further analysis by an independent engineering firm," he said. Cardilli said that through an agreement with the Regional Transportation Authority, the CTA has arranged for Jackson Park riders to use ICG commuter trains for trips downtown. At the 59th Street and 63d Street ICG stations, a valid CTA transfer will serve as payment of fare for Loopbound riders on the ICG, he said. Those leaving the Loop on the ICG will be able to keep their ICG tickets upon exiting at 59th or 63d Streets, and the tickets will be accepted on CTA buses serving those locations. THE ICG FARE from downtown is $1.35. A CTA one-way fare with transfer costs St. Thus, Cardilli said, the alternative measure will cost $2.35 for a round trip, an increase of 35 cents over the regular cost to a CTA rider. In effect, he said, all Jackson Park trains will now, become Englewood trains. Also, all trains will now stop at 55th Street, until now a Jackson Park station only.